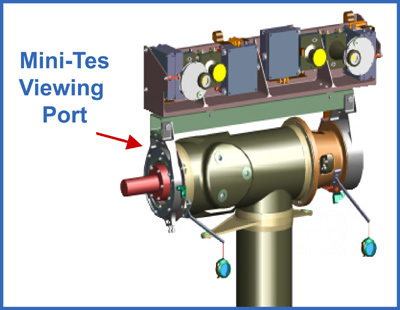 The Miniature Thermal Emission Spectrometer is called Mini-TES for short. Mini-TES measures the different spectrums of infrared light, or heat, emitted from different minerals in rocks and soils. Mini-TES is specially tuned to look for minerals formed in water. MAIN JOB:To determine the mineralogy of rocks and soils from a distance by detecting their patterns of thermal radiation. LOCATION:Mostly inside the rover’s body. The rover's camera mast doubles as a periscope for Mini-TES. Mini-TES is an infrared spectrometer that can determine the mineralogy of rocks and soils from a distance by detecting their patterns of thermal radiation. All warm objects emit heat, but different objects emit heat differently. This variation in thermal radiation can help scientists identify the minerals on Mars. Mini-TES records the spectra of various rocks and soils. These spectra are studied to determine the type of minerals and their abundances at selected locations. One particular goal is to search for minerals that were formed by the action of water, such as carbonates and clays. Mini-TES also looks at the atmosphere of Mars and gathers data on temperature, water vapor, and the abundance of dust. Mini-TES weighs 2.1 kg (almost 5 lbs) and is located in the body of the rover at the bottom of the "rover neck," known as the Mini-TES Mast Assembly (PMA). Scanning mirrors located in the Mini-TES Mast Assembly act like a periscope to send light down to the instrument. This structure allows Mini-TES to see the terrain around the rover from the same vantage point as Mini-TES. Mini-TES looks one way, and the Mini-TESs looks the other way. To make observations of the same location from both of the instruments, the Mini-TES Mast Assembly (the rover's neck) must be commanded to swivel.